How Many People Does It Take to Ruin an Ecosystem? How Can Natural Resources Be Conserved? What Can You Reuse and Recycle? 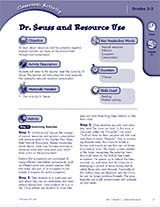 Distribute a printable set of vocabulary words related to the Earth's resources.